Controlling your home security camera from your smartphone is convenient and easy to manage, and undoubtedly one of the biggest perks of Ooma Smart Cam. Live-streaming audio and video from anywhere in the world. Timeline history, and the ability to go back as far as 90 days (depending on your subscription plan). Downloading and sharing video clips. Arming and disarming cameras remotely. Geofencing (Privacy mode): This feature automatically arms or disarms the camera as the owner enters the room (Premium feature). 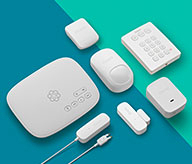 Wireless setup and programming of each camera. Facial recognition: Tagging the names of various people in the home or workplace (Premium feature). Local network streaming (LAN streaming) so that the device can connect directly to the camera without the need for an internet connection. Filtering events on your timeline (by person, sounds, etc.). Scheduling alerts (Do Not Disturb mode): Program the camera to only send alerts during certain times and days of the week. Checking the camera's battery status. Signing up, changing or canceling your membership. Adding or pairing new cameras. 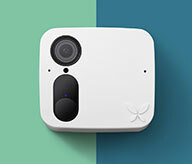 Visit our features page to get a more in-depth look at the capabilities of the Ooma Smart Cam.